We’re factory certified and only work with the largest, oldest and most respected manufacturers in the industry. When it comes to keeping your business safe and efficient, don’t overlook the critical role that your roof plays. Not only do roofs keep out rain, wind and debris, but they also provide vital insulation, preventing your business from wasting energy by letting outside temperatures in. Our team has extensive knowledge and experience with commercial projects and roof systems – so we guarantee we have a solution for you! 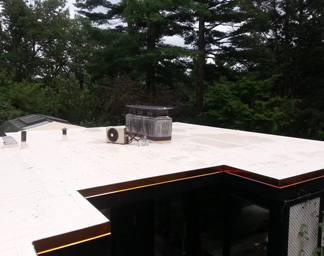 As commercial roofing experts with more than 30 years of experience serving properties in the Lowell area, Constitution Contracting offers a broad selection of roofs. No matter what your company’s specific needs are, we’ll have plenty of options! Single Ply Roof Solutions - Made from a single membrane of PVC, BVC, or TPO, these roofs are highly flexible and easy to install. EPDM/Rubber Roofs - Among the most affordable and durable roofs, ethylene propylene diene terpolymer (EPDM) roofs are easy to repair and maintain. IB Roofing Systems - A type of PVC roof, these roofs are easy to install, and because they are reinforced with fiberglass, they are highly resistant to outside damage and weather. Constitution Contracting is widely regarded as one of the most effective roofing companies in Lowell, a distinction we have earned through our thorough, quality work. Every member of our team is fully licensed, insured and has received the factory training necessary to install any type of roofing effectively. We also invest in professional management methods that ensure high standards of service from our employees to you. 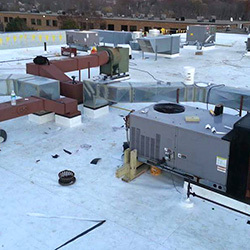 We’ll provide any commercial, industrial, retail property owner or property manager with the peace of mind they need for their new roof installation project. To request a free roof assessment, contact us today!